If, on a late afternoon, you find yourself waiting in a dimmed ophthalmologist’s office for nearly an hour, and you are relieved when the excessive wait –and dilated eyes– force you to forgo your yoga class and gym-climbing night, perhaps your are overdue to just sit, anyway. 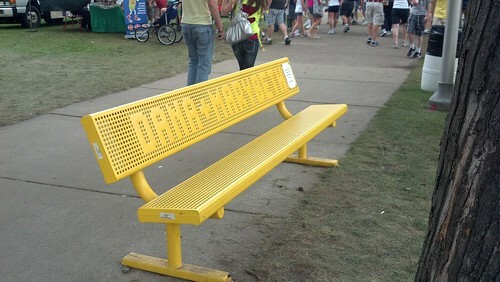 On the sitting front: check out the awesome bench at the state fair, pictured above. I was pleased and surprised to see many of these, with dedications to funders and/or beloved people. And perhaps it’s because I was at the fair early, but often the benches were not occupied. They may not have been in the shade, but at least there was ample room for repose. Food on-a-stick sometimes has to be enjoyed while seated.